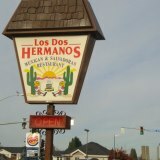 Authentic south of the border fare.This is a great family restaunt. Their specialty is traditional Salvadorian food but there isn't a bad thing on the menu. They make a great cadillac margarita too! Start out going west on Chemawa Rd NE toward Bailey Rd NE. Take the 3rd left onto River Rd N/OR-219. 3590 RIVER RD N is on the left.